Clover Wonder Clips are a great alternative to pins. Wonder Clips can be used as markers or to simply hold things together while you are working on them. Wonder Clips open wide to hold several layers. 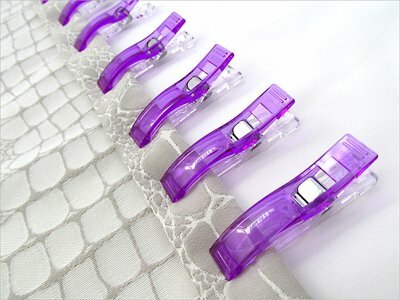 Wonder Clips measure about 2 1/4 inch long and 3/8 inch wide, and have a seam allowance 1/4 inch guide scale, marking up to 1 inch, imprinted on the inside of the bottom of the clip. Purple. 12 pc.